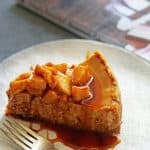 Caramel Apple Cheesecake Recipe – This decadent fall cheesecake recipe, flavored with apple sauce and topped with homemade silky caramel sauce and tender spiced apples, is a holiday showstopper. I haven’t made a cheesecake in quite sometime. I almost forgot how to make one. Cheesecake can be made anytime of the year, but I consider it one of those great fall desserts. I’m so happy to share this new cheesecake recipe! 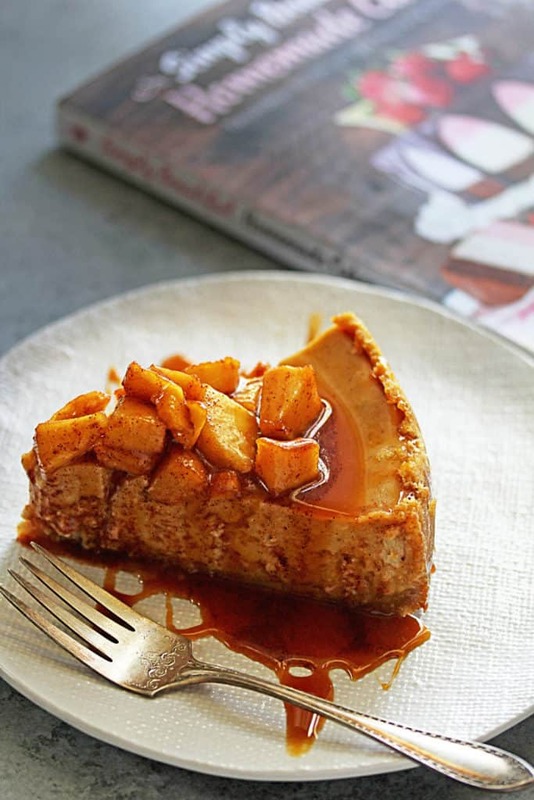 I got this Caramel Apple Cheesecake Recipe from my boo Lindsay’s new cookbook Simply Beautiful Homemade Cakes. 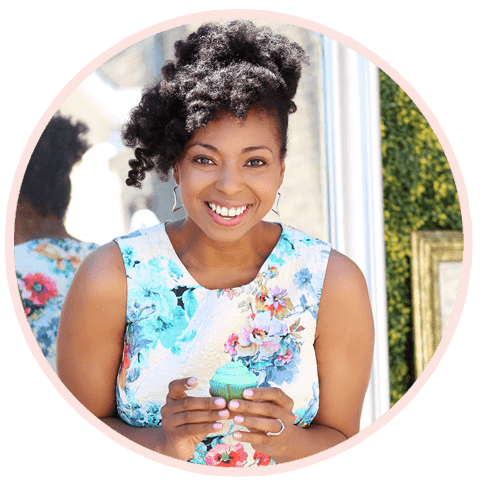 I’ve known Lindsay of Life, Love and Sugar since my early blogging days. I have always adored her as a person, and she can bake a mean cake. 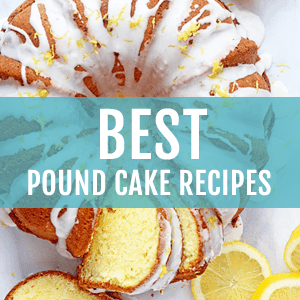 Her spirit is warm and kind, and her cakes are absolutely stunning. I could not wait to get my hands on her cookbook, especially with the holidays coming full steam ahead. a chance to become a new classic! 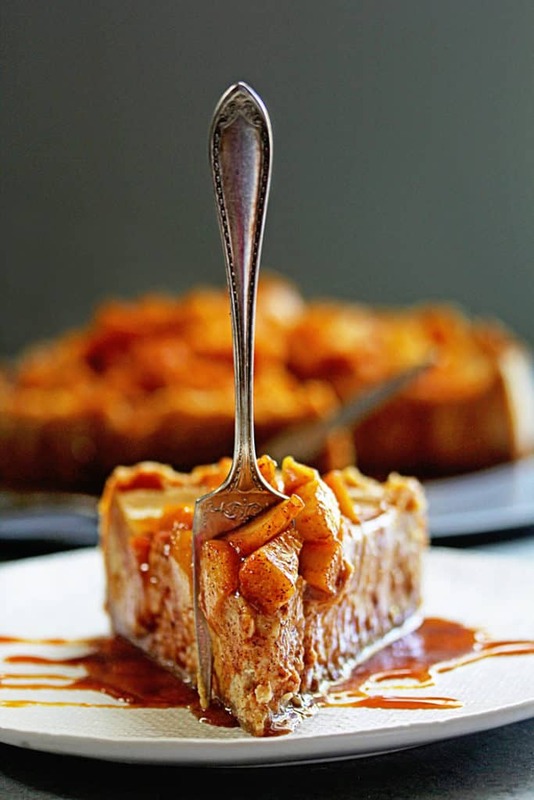 HOW IS THIS CARAMEL APPLE CHEESECAKE DIFFERENT? 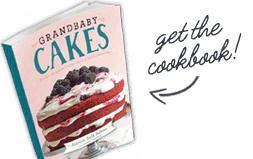 has several tips inside of her book detailing how to bake the perfect cheesecake. The advice is invaluable. The homemade caramel was decadent and perfectly sweet and silky. The apples were tender and spiced just right. Each bite was better than the last, and I can’t think of a holiday that this cheesecake wouldn’t be an absolute showstopper at. It just got added to my Thanksgiving menu. I hope it gets added to yours. 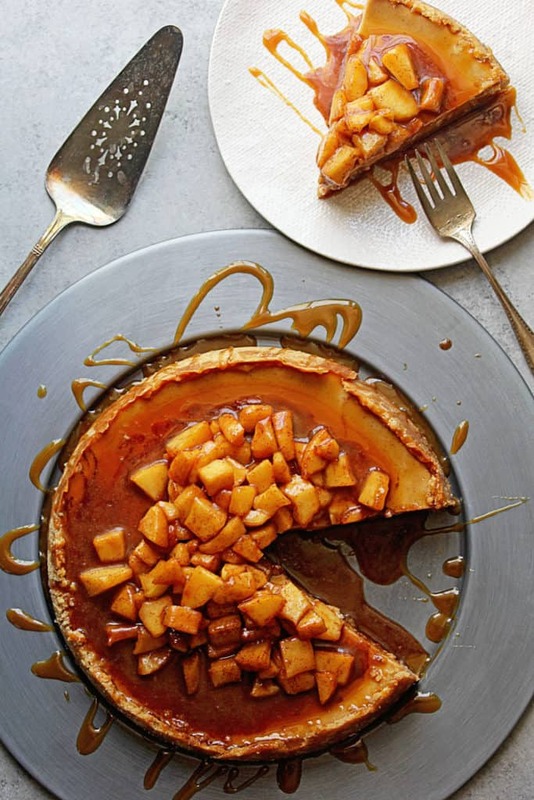 This decadent fall caramel apple cheesecake recipe, flavored with applesauce and topped with caramel and tender apples, is a holiday showstopper. Pour the sugar in an even layer in a large saucepan. Heat the sugar over medium-high heat, whisking the sugar until melted. The sugar will clump up first, but will eventually completely melt after about 10 to 15 minutes. Once the sugar has melted, stop whisking and allow the sugar to cook until it has turned a little darker amber color. You may notice a nutty aroma. The change in color will happen quickly so don't let it go too long or get too dark or it will burn. Turn off the stove but leave the caramel over the heat. Slowly add the butter and whisk until combined. It is very important that the butter is room temperature or warmer. If it's too cold, the caramel will seize. The mixture will bubble up, but keep whisking until all the butter has melted and combined. Slowly pour the heavy whipping cream into the caramel and whisk constantly until incorporated. Again temperature is very important. If it's too cold, the caramel will seize. Set the caramel aside to cool. Preheat oven to 325°F. Line the bottom of a 9-inch springform pan with parchment paper and grease the sides. To make the crust, combine the vanilla wafer crumbs, butter, and brown sugar in a small bowl and stir with a fork to combine. Press into the bottom and up the sides of the pan. Bake the crust for 10 minutes, then set aside to cool. Cover the outside of the pan with aluminum foil so that water from the water bath cannot get in. Set the prepared pan aside. 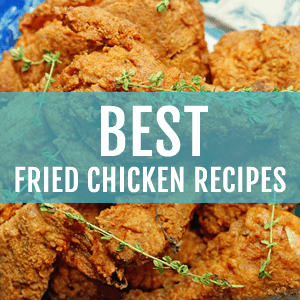 Reduce the oven temperature to 300°F. In a large bowl, blend the cream cheese, brown sugar, flour, and cinnamon on low speed until well combined and smooth. Make sure to use low speed while beating to avoid adding excess air, which will cause the cheesecake to crack. Scrape down the sides of the bowl. Add in the sour cream, applesauce, and caramel sauce until well combined. Add the eggs one at a time, mixing slowly to combine. Scrape down the sides of the bowl as needed to make sure everything is mixed. Pour the cheesecake filling into the crust. Turn off the oven and leave the cheesecake in the oven with the door closed for 30 minutes. Do not open the door! After 30 minutes, crack the oven door and leave the cheesecake in the oven for another 20 minutes. Take the cheesecake out of the oven and let it sit at room temperature for 15 minutes, then remove the pan from the water bath and remove the foil. Wrap it with plastic wrap and refrigerate until it's completely cool and firm, 6-7 hours or overnight. Don't remove the springform pan from the cheesecake until it's done chilling and you're ready to assemble. 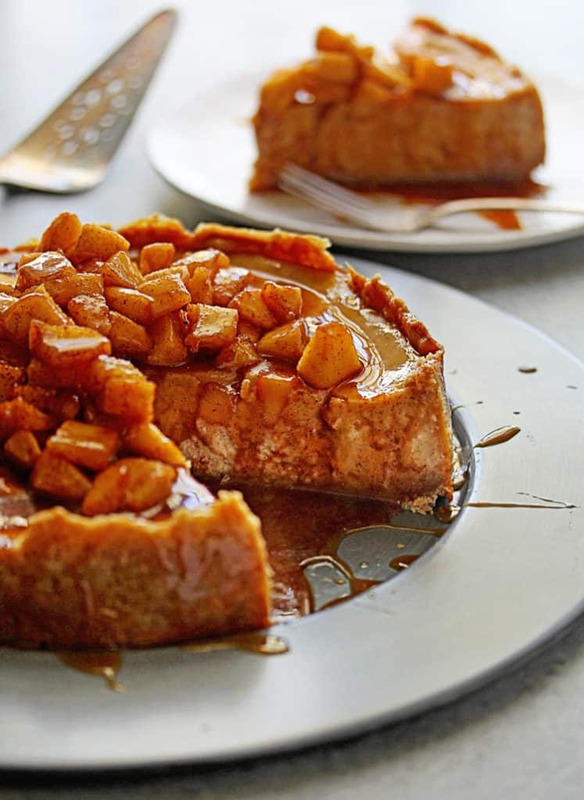 Combine apples, brown sugar, lemon juice, cinnamon, and butter in a large saucepan. Cook over medium heat until the apples are tender, about 10-15 minutes. 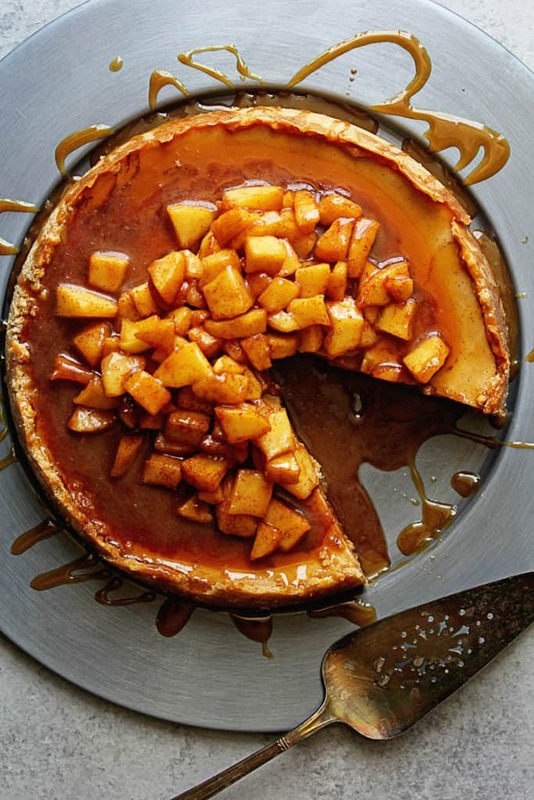 Spread the top of the cheesecake with additional caramel sauce, then spoon the apples over the top in the center. Drizzle additional caramel down the sides of the cheesecake if desired. Refrigerate cheesecake until ready to serve. It's best eaten within 2-3 days but should last 4-5 days. This was SO good! Made it for a neighbour’s (yes, I’m Canadian) dinner. Everyone raved about it. The directions are perfect. I’m super glad you enjoyed it! I I made this tonight for a Christmas party tomorrow. have made many a cheesecake in my day, but this one came out of the oven perfectly. These instructions were great . I’m going to recommend this book to the next person who asks! I’m so glad I enjoyed it! That looks really awesome. I’ve never made cheesecake before, but I really want to try it now. I am about to make this. Wish me luck! I hope it turned out well for you!!! This looks amazing! I was wondering if you felt this recipe would work for individual cheesecakes in a cupcake tin? If so, should I change the cooking time at all? I would love to make this for work but individual portions might work better for serving. 🙂 Thank you so much! Yes you would just need to watch the amount of baking time for this. Yum!! I can’t wait to make this! Thanks~! caramel and apples = my favorite! Oh you have no idea how much I love this! I need to make this asap ! WOW!! This cheesecake is out of this world!! It looks amaaaazing!! My mouth is seriously watering after seeing this recipe. This is a must make! Ohmygosh this recipe! 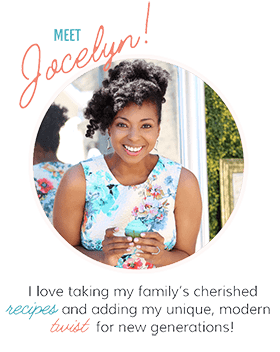 Swooning for real over here! Such beautiful photos and I can’t wait to get my hands on her book! Hooray thank you so much! You will love the book! Hooray it was fantastic boo! Congrats on your gorgeous book!